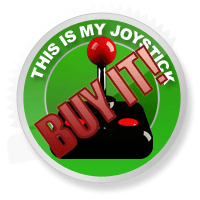 Metal Gear Solid V: The Phantom Pain Review - This Is My Joystick! After confirming the identity and location of an injured prisoner from a Soviet Compound in Afghanistan, I could make my escape. The prisoner in question is an expert in biomechanics and extracting him to my offshore military base would allow me to develop the technology to increase the durability and power of my prosthetic arm, making enemy close-quarter takedowns more time efficient. Unfortunately, his injuries won’t allow him to sustain the shock impact of a Fulton extraction, so he would have to be carried out of the base to a safe distance where the support helicopter could land without sustaining heavy damage and pick us both up. The sun was rising and without the cover of nightfall, I was at risk of being spotted by one of the guards in the tower. With little time, I opted to ‘go loud’ to ensure the quickest optimal route. By taking out the base’s air communications satellite with a C4 charge, my support would be able to land close to my current location and evacuate quickly before the Soviets could effectively respond. It was a risky move. The helicopter sustained heavy fire but I was able to lay down suppressing fire with the chopper’s Gatling gun for just long enough to exit the hot zone. The mission was completed but I had lost points for raising an alarm and killing the guards as the chopper ascended to ‘Flight of the Valkyries’ blaring out of the speakers. Had I equipped myself with the appropriate camouflage for the rocky terrain or invested in a more durable suppressor for my tranquilizer gun before attempting to rescue the POW, I could have netted myself those extra points and a better mission rank. 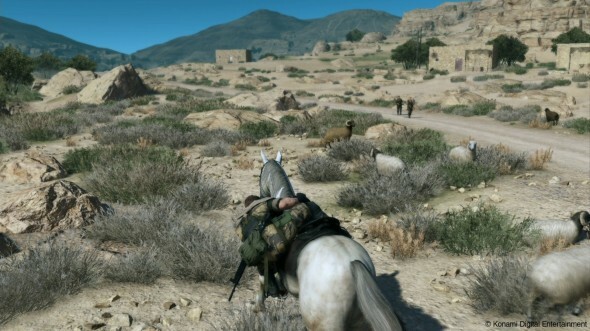 Choice is the key element in Metal Gear Solid V: The Phantom Pain. Too many games offer the illusion of choice through predetermined ‘pivotal moments’ but the result always seems to lead to the same outcome, however it’s played. MGSV turns this on its head and can make the style of play monumentally different through choices that seem insignificant at the time of execution, but are reflected on once the equilibrium is upset. Do you go out on a mission at the crack of dawn or as dusk is setting in? The enemies’ visibility will be lower at night, but so will yours and you risk getting blindsided by a guard who you failed to mark before infiltration. The world isn’t static either. Enemies will respond to the way you choose to encounter missions. If you fancy yourself a crack-shot and continue to take down enemies via their (surprisingly well-filled) skulls then they will start wearing helmets and added protection. You might decide the best way to move around unseen is through the veil of a smoke grenade, in which case, the enemy will equip themselves with gas masks. You’re encouraged to change up your tactics and try out each tool in your immense arsenal in order to counteract these defensive measures. Rather than being repetitive, it makes MGSV feel genuinely alive. The world of MGSV is vast yet incredibly dense. If you are a long-time fan of the Metal Gear Solid series, you will know that the events of The Phantom Pain take place approximately nine years after the event of Ground Zeroes – a one-mission ‘teaser’ of what was to be expected in this year’s entry. Fear not if you haven’t played Ground Zeroes (or any of the other entries for that matter) as the main character Venom Snake (aka Big Boss) spends those nine years between games in a coma, meaning side characters can spoon feed him exposition through cassette tape recorded briefings. In fact, most of the dialogue appears to take place through cassette tapes. Metal Gear Solid is notoriously infamous for its info-dumping, time-consuming cutscenes. With the main story being relegated to optional audio files, these cutscenes no longer exist meaning gameplay is less stilted. If you do decide to listen to the audio files, you will know that Snake’s mission now revolves around combatting Cipher, a terrorist cell led by the mysterious Skullface, which was responsible for landing Snake in a coma and the destruction of Mother Base, his offshore military facility. 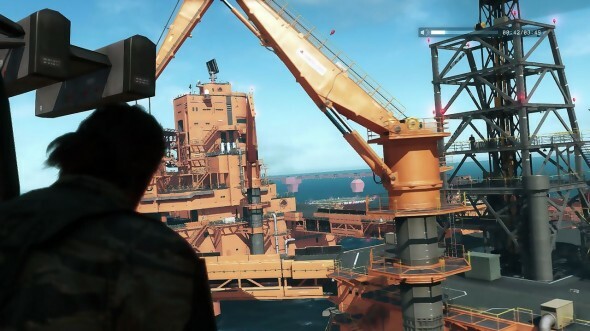 Mother Base plays an important role in MGSV. When not on missions out in Soviet Afghanistan or the West Coast of Africa, Snake is managing the reconstruction of his military empire by rebuilding platforms and developing new technology for him to use on the field of battle. New staff members can be recruited by extracting downed enemy soldiers using the Fulton Recovery Device. They are then ‘convinced’ to join your cause and will be assigned to areas that best suit their set of skills. If they are proficient in medicine, they will join your medical bay and increase the healing rate of injured crew members. If intel is their thing, they will help scout out for relevant information such as enemy patrol routes ahead of your deployment, and so on. It’s an elaborate business management system but utterly necessary for turning the tide in your favour, especially in the endgame. In online mode, Mother Base also acts as a stronghold against other players. At any time, other players can attempt to invade your base and abduct your workers and equipment. If they get caught, however, you will be alerted to the location of their enemy base, meaning you can attempt to do the same to them. It adds a nice risk/reward factor and is a non-invasive optional multiplayer mechanic that can be turned off at any time if you get sick of ‘Intruder Alert’ notifications that might be taking place whilst you try to play the main game. Mother Base isn’t just a set of management menus but a real, physical place. Visiting it often helps to raise morale of your workers. Development doesn’t just take place in the Research and Development department of Mother Base either. Before deploying for missions, you choose your loadout, apparel and a buddy. There are four buddies in the game that gradually become available to you: D-Horse, D-Dog, D-Walker and Quiet. D-Horse is excellent for covering great distances, which is useful for getting from A to B quickly but not much else. D-Dog will stay by your side and mark enemies and items on your map in a close facility – a very useful companion to have during close infiltration. D-Walker is an armoured bipedal robot that is modelled after the titular Metal Gears that acts as a rideable ‘mini-tank’, which works well for full-frontal assaults. Finally Quiet, a deadly female sniper that can take position from high vantage points and provide cover fire for you on the ground, which can help create a distraction and draw unwanted attention away from you. The more time that is spent with each buddy, they gradually unlock new abilities and equipment that can vastly improve their usefulness. Out of all of the buddies, D-Dog is by far the most useful on a stealth play through as he will remain out of sight of enemies as long as you do too. Funnily enough, my personal favourite factor of the game isn’t any these core components. It’s the soundtrack. Along with the characters’ briefings, licensed songs from the 80’s can be found in certain areas and they alone bring an authenticity to MGSV’s often cynical world. Even when the subject matter touches on some delicate subjects such as child soldiers and nuclear disarmament, it’s nice to sit back and sneak around an enemy base blaring out A-Ha’s Take on Me. Try not to crack a smile, I dare you. There are a lot of different elements that make up the entirety of MGSV and few of them act as filler. Every option that the game offers you does so in order to better the experience overall. I’ve been playing the game for many hours and still feel that I have yet to scratch the surface of it, even after completing the main campaign. As of writing, MGSV tells me that I have completed 52% of the entire game and that sounds about right. It doesn’t surprise me that 48% of everything MGSV has offered me has remained untouched. I intend to at least try finding everything. If you haven’t already picked up Metal Gear Solid V: The Phantom Pain, correct this immediately. Pick it up, then put it back down and pick it up again, so you have had the pleasure of picking it up twice. Feel free to repeat this process as many times as possible because this is a very strong contender for the Best Game of 2015. It’s most certainly the best game in the Metal Gear Solid series and one of the most finely crafted stealth games of all time. 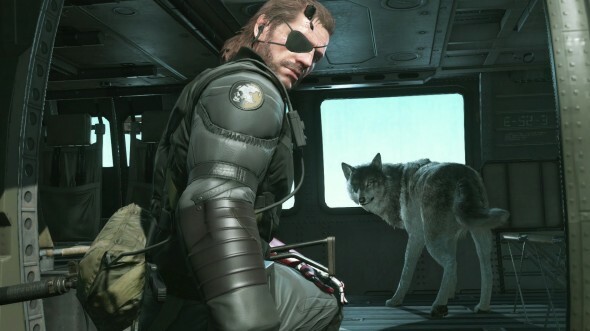 It’s a shame that this will be Hideo Kojima’s last Metal Gear Solid project since his dismissal from Konami, but it’s a damn fine send-off for one of the longest running video game franchises of all time.